July 3, 2004, Saturday, 3:00pm till closing at Barnes and Noble Bookstore, Friendly Shopping Center, Greensboro, North Carolina - Ken Henry (Archerfish Crewmember 1959-62 / Author), Mike Burkholder (Archerfish Crewmember 1967-68) and members of SubVets WWII and USSVI Tar Heel Base. Held in conjunction with annual 4th of July Parade (SubVets/USSVI unit marching). Local media coverage. (From Pig) "Just a quick note about our signing in Greensboro, N.C. on July 3rd. To say we had a great day would be the understatement of the century! I had trouble getting to sleep, after we finally stopped for the night in Blytheville, S.C., as I was still on cloud nine. Today Colleen and I talked all day about how great a day it was as we drove the rest of the way home. (575 miles from Mike's driveway to mine) There are no words to express what a wonderful time we had in Greensboro, thanks to Mike and Maryann Burkholder, the North Carolina Sub Vets, and Becky Carignan from the Greensboro Barnes & Noble store." "Ken and Colleen showed up around 6pm on Friday evening. We grilled steaks out in the back yard and told sea stories. Didn't get to bed until close to midnight. Got up early and went to a neighborhood restaurant for breakfast after reading an article in the paper about the Archerfish and the book signing. The newspaper had interviewed me a few days earlier and even put my picture in the paper too. My 15 minute of fame." "Drove the Graham with USSVI placards on the doors. Introduced them to all of the NC Subvets when we got to the parade staging area. My guys were really happy to meet them and I think we had about 20 guys (or more) show up to march in the parade. Had our parade submarine there of course. Ken marched with the troops as I had to drive the Graham. The women went on upstream to watch the parade. It was a great parade and I know Ken enjoyed it." "After the parade we took the Graham home and freshened up a bit and then the four of us jumped into my '73 Electra and headed over to the Friendly Shopping Center. We joined up with the other subvets and their wives at Tex and Shirley's restaurant for lunch. We could see Barnes and Nobles from the parking lot. We went to Barnes and Nobles at 2pm (an hour earlier than the book signing time) and put the submarine up on the sidewalk right by the front door. Started to draw a crowd right away. All of the subvets had our vests on so we were an item right away. They had 46 books stacked up on a table with one chair for Ken to sit at and sign books and then there were chairs aranged for seating about 30 people. We started selling and signing books immediately and had sold about 15 before the 3pm startup. Ken brought the albums from phase four and I brought my own album so the troops could browse through them too." "At 3pm all the chairs were filled and people were standing all around and then the lady in charge, Becky Carignan, introduced herself, Ken, and me. She then gave Ken a tiny mike to put on his shirt so he was to read. Ken quickly handed it off to me and I commenced. Ken was more comfortable shaking hands and signing books than talking to the audience. I seized the moment and started rambling about life on a submarine and how unique the Archerfish was and blah blah blah. All of a sudden this guy comes up and slides a card in front of me and asks me if he can get a discount with this card. Well I look at it closer now and it is a Archerfish liberty card made out to a Gene Gregory. So I look up at him and here it is one of our seamen who was on the boat when we decommissioned her. He read about the book signing on the Archerfish website. He drove four hours down from Virginia to be there. I had not seen him since May of '68. Wow!" "One gentleman who came for the book signing was an assistant to John Craven, who was involved in many top secret clandestine operations involving many submarines. Pig Pen about fainted when this guy opened up telling him about taping the sounds of Archerfish as she was breaking up after being topedoed by Snook." "30 books were sold on the spot and Ken signed the remaining 16 for the store shelf. My pastor called me up later that evening and told me he was late getting there but bought one after we had all left. So we can safely say we sold 31 books yesterday. Barnes and Noble (Becky Carignan) was really good to us and went all out. They even made posters with pictures of Ken and the Archerfish on it. He was given those to take home with him at the end of the session." "It was a fabulous day and I am so proud to have been part of it all. Ken, me, and all of the NC Subvets were pumped up on a high all day. Ken and Colleen left our house and were headed home to Florida around 1730. He said they would probably stop overnight somewhere but he just wanted to get some miles behind him." 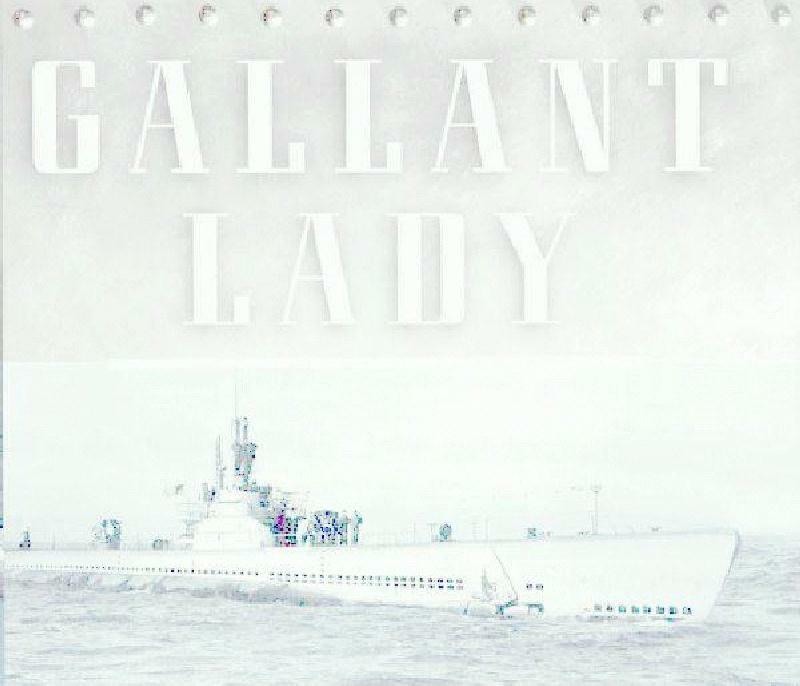 "Well, that is my report on our "Gallant Lady" debut here in Greensboro,North Carolina. It was very successful to say the least. Wish you could have been here with us." "Your shipmate, Mike 'Engines Forward' Burkholder"
July 7, 2004, Wednesday, 7:30 - 8:30am at Riverside Chamber of Commerce - Business in Action Meeting, Riverside, California - Jerry Cornelison (Archerfish Crewmember 1967-68). Introduction of "Gallant Lady" book and presentation on Archerfish history and memorabilia.